These are a size 32x32. These are the Prewashed variety from the glorious year of 1987. Great prewashed shade of blue. leg opening: (at the bottom hem of the jeans) 16". They are in like NEW condition. ~ Matte silver buttons, the top one is stamped 544. It is your responsibility to check on these costs beforehand if it is of concern to you. ~ Classic 501 red tab style. 64% Cotton- 36% Polyester Denim. Saddleman Boot Jeans. early 80's. Made in USA. Textile is unmarked. Big E Levis green jeans. Two front pockets and two back patch pockets. Straight leg. 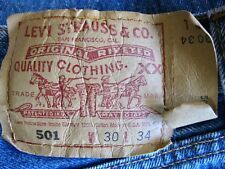 Label: Big E Levis. Leg Opening: 16". Closure: Zip. Accessories are not included unless otherwise stated. 64% Cotton- 36% Polyester Denim. Saddleman Boot Jeans. early 80's. Made in USA. Made in US A. Colors may be slightly different due to monitor settings . Has Patch For 1984 Democratic National Convention. Preserve the past and blast off to the future - Get Real Gone! Good: Multiple minor flaws or minor repairs required. These jeans are in good pre-owned condition with no holes, stains or tears. Structurally sound and very wearable. Doing that is against U.S. and international laws. Therefore, many of them will show light signs of wear. 17.5” back rise. 13.5” front rise. 8.75” cuff across. 10” knee across. 501 LEVI'S Vintage Early 1980's-35/33-MAD FABULOUS JEANS- ONE ORIGINAL OWNER:Me! But what I say is this: This is a GREAT pair of sturdy Levis that when you put them on and wear them, they FEEL LIKE A PAIR OF 501 LEVIS! And he paid more because there weren't any wear spots yet! I myself, bought and wore these Levi's back in the early '80'S! Vintage 1980s Levi’s 317 Saddleman Orange Tag Boot Cut Denim Jeans 33x31 - RARE! These are the orange tab with zip fly and are in excellent condition with no holes, stains or fraying. This pair is 30 years old and made much better that their modern counterparts. Size: 33x31. Leg Cuff: 9”. This is a rare and collectible pair of Levi's 501 single stitch redline selvedge jeans from the 1980s. Made in the USA. 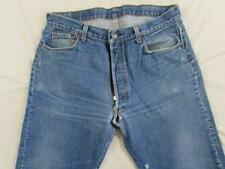 The jeans are in good vintage condition with stable repairs over the years. Just one hole at the knee. Beautifully repearaid with Singer 47w70. The chain stitch at the hem are a little bit unstitched as you can see on the picture, give him very strong character. Bottons back stemped "6" Size 31x31. Don't hesitate to ask me any others questions. OLD SCHOOL JEANS. CLASSIC, STRAIGHT LEG. SOLID JEANS. (25.4cm) Across Thigh. BLACK BAR TACKS. These are our standard rates. Rates will be higher for large sizes or extra heavy jeans. (19.1cm) Leg Opening. • Light blue denim Levi's Jeans. • Circa 1980s. • Two front pockets / Two back pockets with orange tab on right side. • Orange contrasting stitching. Orange tab. There are light stains in front, and a hole in the back of the right pocket. REALLY GREAT CLASSIC JEAN SHORTS. GREAT JEAN SHORTS! DON'T LET THESE GREAT JEAN SHORTS GET BY YOU! These are our standard rates. Rates will be higher for large sizes or extra heavy jeans. U.S.A. CANADA OTHERS. I do not know how old these are exactly, but the patch says 130 years so doing the math it would be from 1983 (1853 130 years). You did it! You found the perfect jeans! Broke-in, but not worn-out Fantastic fade but not all shrunk from improper washing/drying. Nice pair of 1980's Levis 501 jeans. Shoulder Width: top of the shoulder seam to the top of the opposite shoulder seam, laying flat. Inseam: 34". Chest: pit to pit, laying flat. Sleeve Length: top of the shoulder seam to the end of the cuff, laying flat. Unbeatable quality for a piece from that era. That is the only definition of "major flaw" that we are willing to accept. Sleeve Length: top of the shoulder seam to the end of the cuff, laying flat. CONDITION: used / preowned. ORIGINAL LEVI'S 505 TOTALLY 1980s JEAN. FAIR CONDITION (has been washed and ready to wear ). LIGHT BLUE. MADE IN USA. SIMPLE LETTER PRIORITY A'.